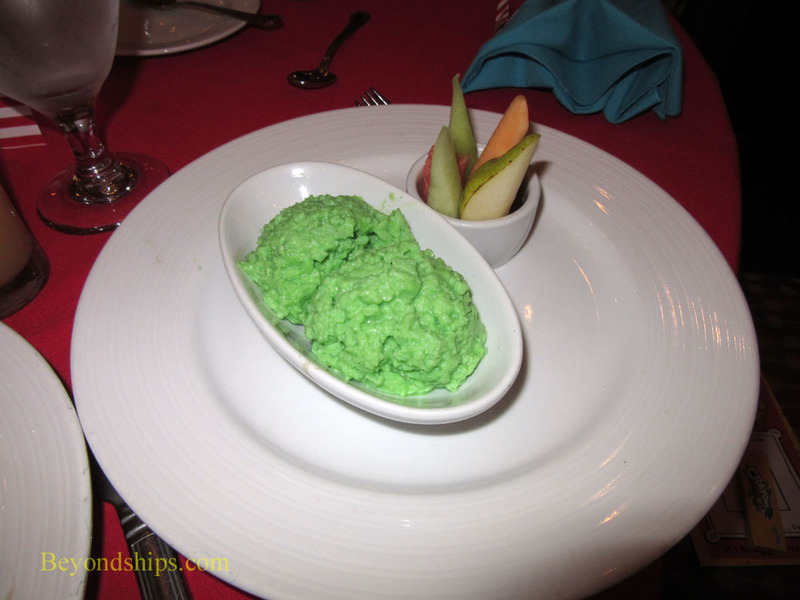 Guests cruising on Carnival Splendor have the opportunity to sample a dish that has been written about extensively but which is found on very few menus even in the finest restaurants. Furthermore, you can dine with a group of celebrities who every child knows. All of this takes place at the Green Eggs and Ham Breakfast, which not only features the title dish but which is attended by the Cat in the Hat and friends. 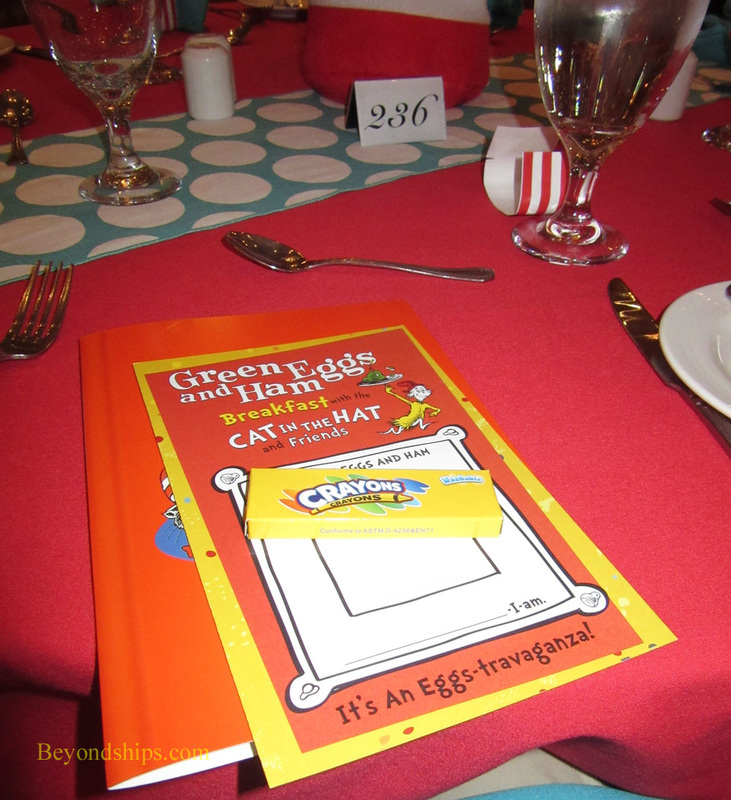 The Green Eggs and Ham Breakfast is part of Carnival's Seuss at Sea program - - a partnership between Carnival and Dr. Seuss Enterprises based upon the world famous children's books. In addition to the breakfast, the program includes a number of activities such as a parade in which the Dr, Seuss character participate. The Dr. Seuss characters were created by Theodor Seuss Geisel. Although educated at both the Ivy League Dartmouth College and England's prestigious Oxford University, Geisel was not a doctor nor did he have any academic training in child psychology. Rather, his early career was spent as a cartoonist doing advertising and political catoons. He became involved with children's books in the 1930s when Viking Press asked him to illustrate a collection of children's sayings. This inspired him to write and illustrate his own children's book To Think I Saw It on Mulberry Street. His book was rejected some 40 times before finally being accepted by a publisher in 1937. After World War II, Geisel returned to children's books. However, his most famous book, the Cat In The Hat, was not published until 1957, making his nom de plume a household name. All told, he wrote over 40 books, which have sold more than 200 million copies and been translated into 15 languages. Geisel's characters have appeared in television programs, movies and a Broadway musical. 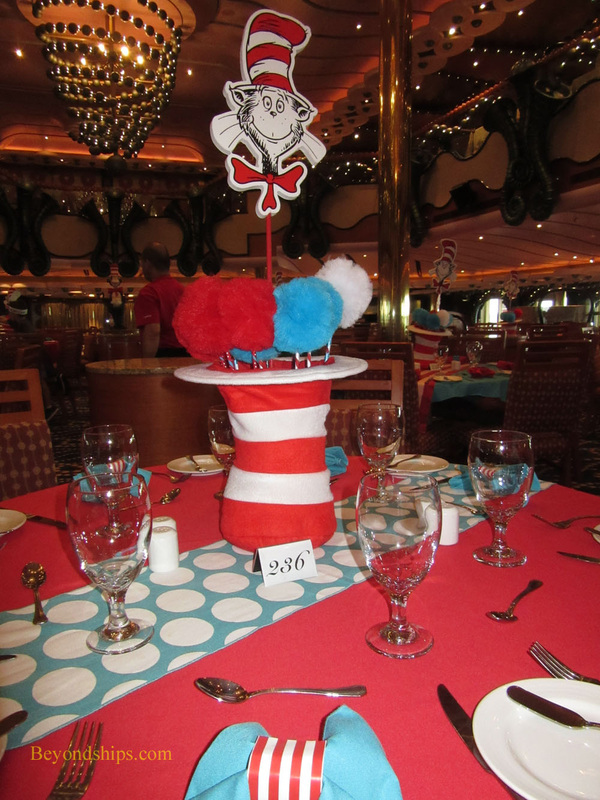 Debuting in early 2014, Carnival Splendor was the first ship in the Carnival fleet to offer the Seuss at Sea program. According to Splendor's Hotel Director Nickolos Balistatos, the guest reaction has been very positive. 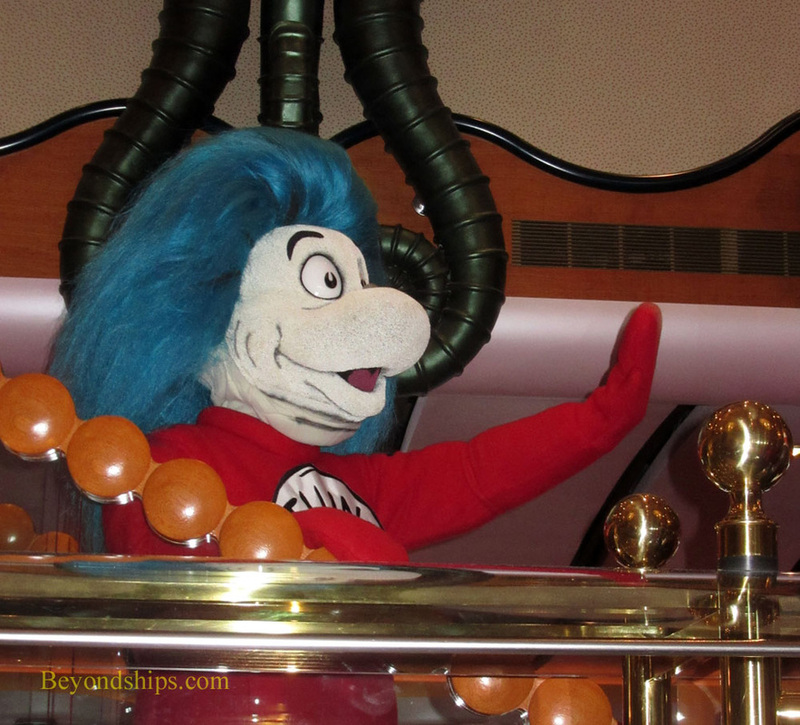 Naturally, Carnival's Seuss at Sea program is targeted at children. The line carries some 700,000 kids a year and has a well-developed children's program called Camp Carnival. Indeed, at the Green Eggs and Ham Breakfast that I attended, the adults outnumbered the few children who were on this early autumn cruise to Canada and New England. The Breakfast is held once a cruise in the Black Pearl Restaurant, one of two main dining rooms on Carnival Splendor. 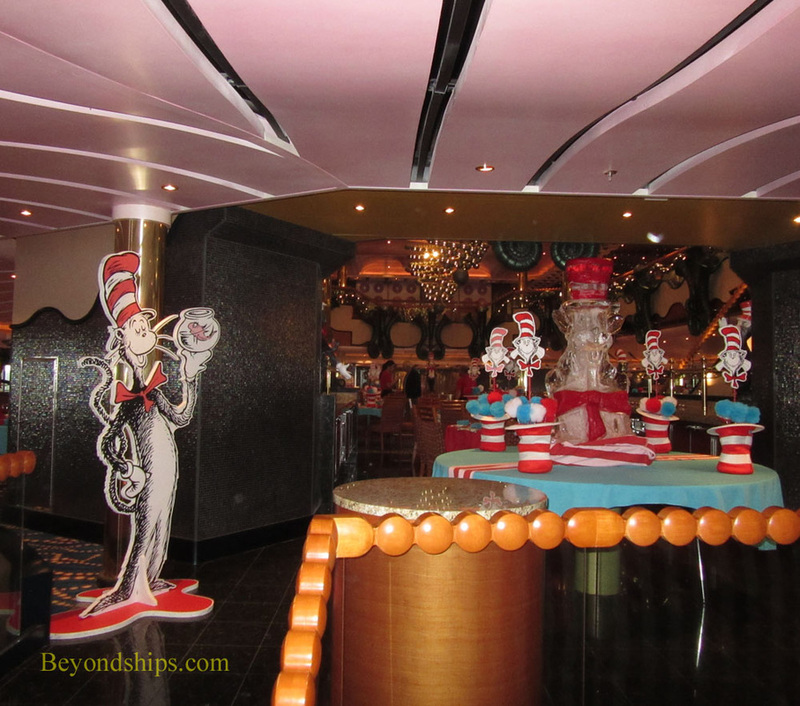 Entering the restaurant from the ship's main lobby, you immediately see that the room has been transformed into a Seuss fantasyland with cutouts and statues of the Cat and the Hat placed at the entrance and by the stairs leading to the balcony level. Similarly, the tables were specially-decorated. The centerpiece on each table was a large striped top hat with a cutout of the Cat's head hovering above it. Red tablecloths and light blue napkins had replaced the resturant's usual white ones. In addition to a special menu, each place had a set of crayons and a small booklet with games and rhymes waiting for the particpants. The waiters too had special uniforms. Instead of their usual vests and bow ties, they sported red tee-shirts with an emblem identifying as “Thing” followed by a number. Essentially, this was the same outfit that the members of the ship's youth program staff were wearing except that they had a Dr. Seuss emblem on their tee-shirts. Done in rhyme and with illustrations of the Dr. Seuss characters, the menu presented a number of imaginative offerings. These included such things as “Fox in Socks Steak and Eggs”, “Funny Belgian Waffles,” “Scrambled-Super-Dee-Booper Special de luxe ala Peter T Hooper omlets” and stacks of red, white and blue pancakes. You could also have “Moose Juice” and “Goose Juice” also known as orange juice and apple juice respectively. I selected Horton's Cereal Crusted French Toast for my main course. 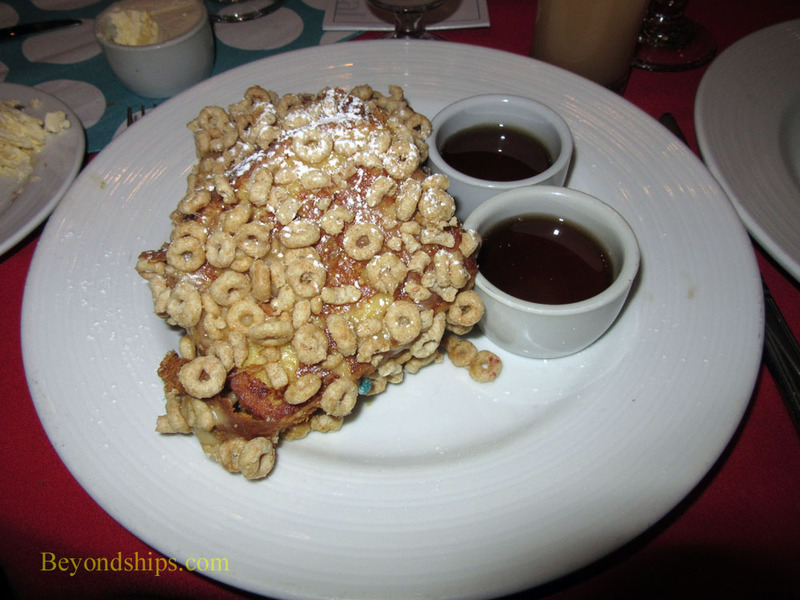 This dish combined a layer of Cheerios with a thick slice of French Toast. I like both of these items separately and was surprised to find that they are good together with the cereal providing a different texture to the soft toast. Of course, the menu included green eggs. Moreover, you could select how your eggs would be cooked. I ordered them scrambled and they arrived looking like scrambled eggs except light green in color. The color I was told came either from s secret magic spell or else food coloring. Whatever the source of the color, they tasted just like scrambled eggs. 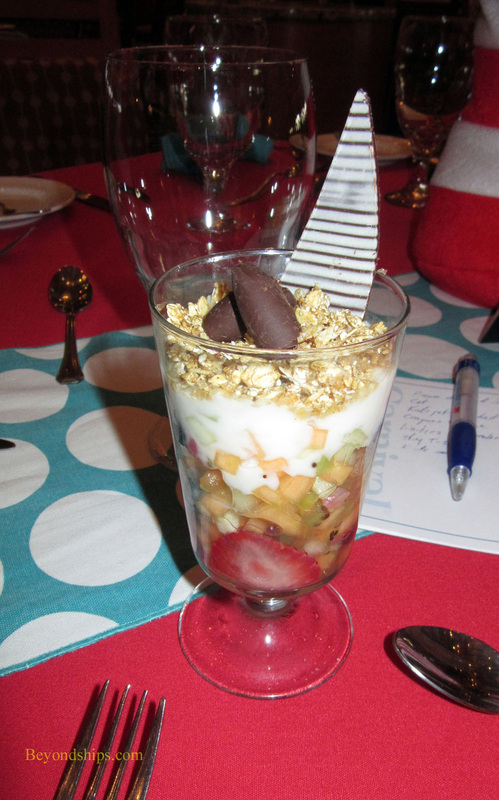 An item I particularly liked was the “You Can Think About Yogurt Parfait Schlopp.” This was layers of granola, yogurt and fresh fruit presenting a variety of flavors and textures. 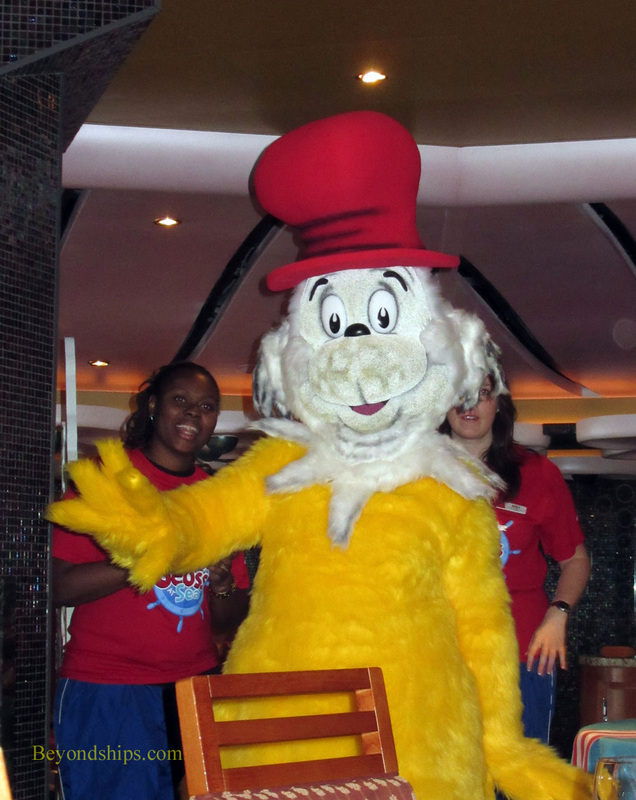 The Dr. Seuss characters arrived in the restaurant as the meal was progressing. First to arrive were Thing One and Thing Two. They visited each table, waved and posed for photos. When our host arrived, the procedure was slightly different. The Cat in the Hat came in waving and went to the center of the restaurant. He was immediately surrounded by guests wishing to have their photos taken with him and he patiently posed with each one. Such is the price of fame. The final character to enter also drew the attention of the crowd. Afterall, Sam was the one who had issued the now-famous condemnation of green egges and ham - - the very dish we had gathered to celebrate at this breakfast. He too posed for pictures before disappearing back towards the ship's lobby. None of the characters spoke during their appearances. I am told that if they had, they might have sounded like certain members of Splendor's youth staff who were nowhere to be seen when the costumed-characters arrived. The characters were guided around the restaurant by other members of the youth staff and communicated with hand and body gestures. I was pleasantly surpised by the Green Eggs and Ham Breakfast. Beforehand I had been skeptical how tolerable such an event would be for an adult. However, it was easy to get into the warm atmosphere that Carnival created. This was faciltated by the fact that both the youth staff and the dining room staff looked like they were happy to be there and wanted the guests to be happy as well. The unsual menu also helped as it was both creative and tasty. There is a $5 cover charge for the Green Eggs and Ham Breakfast.